From the August 2013 Desktop News | The University of Alabama has opened a new gallery in Downtown Tuscaloosa that will provide a public showcase for UA collections, artifacts, and art. Part of the new Dinah Washington Cultural Arts Center (CAC), the gallery is the culmination of collaborative efforts between the University, The Arts and Humanities Council of Tuscaloosa, and the City of Tuscaloosa. It will be managed by the College of Arts and Sciences. The gallery’s inaugural exhibition, “A Magic Carpet Ride: Rugs of the Ottoman Empire from the Collection of Dr. and Mrs. William T. Price,” will run Aug. 29 to Oct. 24. “Downtown Tuscaloosa is rapidly becoming a hot new cultural and entertainment destination for our community, and the opening of the Cultural Arts Center by the Arts and Humanities Council is certainly a cornerstone event in that process,” said Robert F. Olin, dean of the College. “The experience of walking down the street and encountering a work of art or cultural beauty that catches both the eye and the imagination should be a frequent moment in any vibrant city. The University of Alabama has much to offer to make that happen, and we are delighted to partner with the council and other UA divisions to bring more of those opportunities to the community through the new gallery,” he said. The gallery will present a year-round schedule of artistic and cultural exhibitions from the University’s permanent collections as well as by UA guest artists, faculty, and students. “A Magic Carpet Ride” features 21 rugs of the Ottoman empire, most of which are from Anatolia, an area that is part of modern-day Turkey. The region is noted for its many rug-making centers. 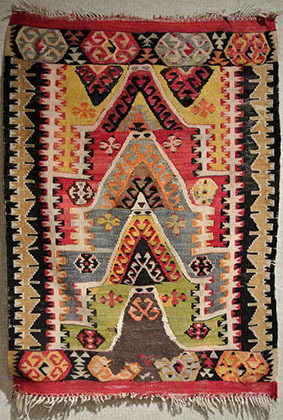 After centuries of foreign incursions, the rugs draw inspiration from a variety of cultures in their designs. Two of the Turkish rugs featured in the exhibit are from the 18th century, while the majority of them are from the 19th century. The items on display include hand-knotted pile rugs and flat-woven rugs, as well as other textiles that display many kinds of techniques such as embroidery and applique, and they are made from a variety of materials that include wool, silk and metallic threads. The Prices have amassed one of the finest collections of Asian art that includes works from South Asia, Southeast Asia, Central Asia, Japan and India. It includes Japanese prints, screens and ceramics; Middle Eastern rugs; Islamic art; and numerous fine Asian sculptures and paintings. Portions of their collection have been exhibited in numerous museums and galleries in the United States. William T. Price, a native of Tuscaloosa and 1943 UA graduate, began his life-long relationship with Asian art in 1953 while stationed in Japan with the U.S. Army Medical Corp. His first purchases were of Japanese woodblock prints. Those purchases ignited his interest in Japanese art and the Japanese language. He returned to the United States two years later with some 500 prints and a lasting love of art and collecting. The University of Alabama Gallery and the Dinah Washington Cultural Arts Center are located at 620 Greensboro Avenue in downtown Tuscaloosa. The gallery is open Monday-Friday 9 a.m. to 5 p.m. except the first Friday of each month, when it will be open from noon-8 p.m. For more information about the gallery, phone 205/342-2060.